An integer is a whole number. It can be positive or negative. Positive numbers are bigger than zero. Negative numbers are smaller than zero. We use negative numbers to talk about things that are less than zero. For example, if the temperature is below zero, it is negative. -30 degrees is very cold! If a football player loses yardage on a run, he runs for negative yardage. A spot on the earth that is below sea level has a negative elevation. Here is a number line with positive and negative numbers. Positive numbers are to the right of zero. Negative numbers are to the left of zero. Negative numbers always have a negative sign (-) in front of them. For example, -2 means negative 2. Opposite numbers are the positive and negative of the same number. For example, 3 and -3 are opposite numbers. The absolute value of a number is the distance it is from zero. We can find the absolute value by taking off the negative sign if there is one. The absolute value of –3 is 3. The absolute value of 7 is 7. We write the absolute value using bars. For example, |-8| means the absolute value of -8. 1. Is 560 an integer? 2. Is ½ an integer? 5. What is the opposite number of 2? 6. What is the opposite number of -5? 7. What is the absolute value of 6? We can compare the size of different integers. For positive numbers, larger numbers are bigger than small numbers. For example, 10 is larger than 5. 10 is farther to the right of zero on the number line, which means it is larger. For negative numbers, though, the opposite is true. The higher the negative number, the farther to the left it is from zero. That means that it is smaller. -10 is smaller than -5. All negative numbers are smaller than positive numbers. 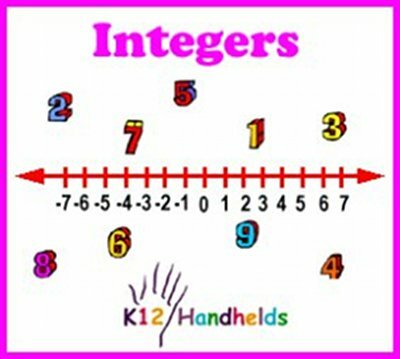 We use the symbols >, <, and = to compare the sizes of integers. The absolute value of -7 is 7. This is equal to the 7 on the other side. Now, you can practice some. 9. Choose the correct statement. 10. Choose the correct statement. 11. Choose the correct statement. 12. Choose the correct statement. 13. Choose the correct statement. You can see from the above that when we add two positive numbers, we add the numbers and the answer is positive. When we add a positive and a negative number, we subtract and the answer takes the sign of the number with the largest absolute value. When we add two negative numbers, we add the numbers and the answer is negative. Practice these on your own. Now, let’s look at subtracting integers. Subtracting an integer is the same as adding its opposite. Practice these problems on your own. Begin by rewriting the problem as an addition problem. Then find the answer using the rules you learned for addition. The rules for dividing integers are similar to multiplying.